Product #18312 | SKU 090000-0100-245 | 0.0 (no ratings yet) Thanks for your rating! 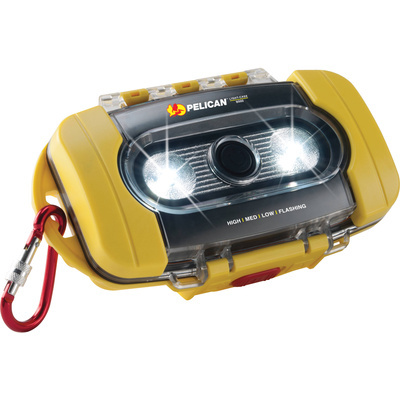 Keep your small gear clean and dry while also finding your way through the dark with the yellow Pelican Light-Case 9000. Two LED emitters on the case provide constant-on outputs of 30, 100, and 200 lumens, as well as a flashing signaling mode. A stand on the back of the case folds out to allow the case to be propped up, and it also doubles as a hook, allowing you to hang the Light-Case 9000. A locking latch keeps the case closed, and an included carabiner allows for quick attaching and detaching to a loop. Four AA batteries are included to power the LED lights.